Kevin Durant, Kevin Durant...name so nice you say it twice! I'm sure his name was mentioned more than twice since he was the hero of last night's game. 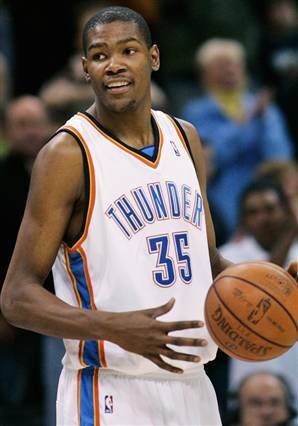 Humble Durant made a generous contribution to Thunder's victory by scoring 26 points and eleven rebounds. This all happened before coach Scott Brooks assigned him Hornets' forward David West with only five minutes to go. 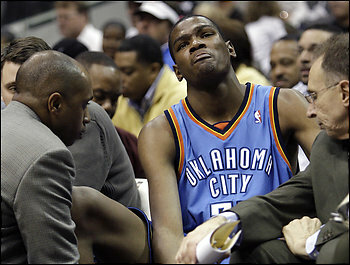 That's when Durant's game made my heart pound crazy. His wingspan proved to be instrumental at blocking an almost 100% dunk from Okafor. Besides Durant's astonishing appearance, a worth mentioning moment is when Jeff Green used his gummi-bear jump and blocked spectacularly Chris Paul. Westbrook's appearance was also amazing. He finished the game with 25 points, eleven assists, five rebounds and five steals. Scott Brooks' decision to put Durant in the defensive end was a smart move. By doing so, he not only won the game but also showed that Durant is a well-rounded player and can do anything as long as he puts his mind to it. Thomas Carlyle once said: Not what I have, but what I do is my kingdom. Thunder's home win over the Hornets is one more proof that Kevin Durant is a great leader who is leading his kingdom at winning the battles. Yes, definitely McDonald's but also Russell Westbrook's incredible dunk over Shane Battier. He did his best by scoring 23 points and ten assists, which weren't enough at winning the game. The Thunder fell to Rockets with a result 98-99. Kevin Durant did a good job but wasn't in his best shape. With only 29.9 seconds remaining, Durant failed the shot which would help OKC leave from Houston with a victory. Serge Ibaka replaced Nenad Krstic who has a sore lower back. This decision proved to be great since Ibaka scored 16 points and eight rebounds. OKC's next game is against the Hornets. Both of the teams have experienced losses so there will be a clash of titans. Since OKC is hosting, they will definitely offer a great hospitality to New Orleans Hornets. The latter will probably leave from Oklahoma City with something... a loss, that is. Besides being the world's coolest robot - Terminator, Arnold Schwarzenegger said something very important when it comes to winning and losing. He said: Strength does not come from winning. Your struggles develop your strengths. When you go through hardships and decide not to surrender, that is strength. That's what Kevin Humble Durant and the rest of the team should always remember. No matter if they win or lose we will always be there to cheer for the Thunder and support them. One for all and all for one, right? OKC’s duo, Kevin Durant and Russell Westbrook put some hocus in their pocus last night! I’m not sure if this magic happened due to Thanksgiving and Black Friday, but the Thunder was certainly giving away points like they were presents while the Pacers’ defense just couldn’t get enough! Last night’s victory was all Westbrook. He scored 43 points – that’s FORTY-THREE points! These great scoring numbers were a powerful catalyst to OKC’s victory over Pacers with a result 110-106 in OT. Due to circumstances, like time zone, I couldn’t watch this game. So there will not be any details or slow – mo’ this time. Only some vivid imagination with Kevin Durant. Scoring, that is. Anyway, life’s good people. Especially during the holidays when we have the chance to show our generous side and thankfulness. Among other things, I’m thankful for technology’s advancement that breaks all barriers, such as time zone. By doing this, it enables people like me, who happen to live on the other side of the world to keep up with the wow’s of the now. But one day, I’ll see Oklahoma City Thunder’s games in person. Someday, someway, somehow, I won’t need no technology, not even 3D screens. I will actually do something that for other people turned into a habit. Oh, Earth’s calling. I better get that one. Thunder’s next game is against Houston Rockets. It might be easy, it might be difficult. It all depends if our guys continue adding that hocus in their pocus. But whatever happens, always remember that life is good. God is a great painter. Everything He creates is a work of art. If you don’t believe me look at the sun, the moon and the stars…and don’t forget thunder! So the winning streak was broken on Wednesday night by Dallas Mavericks. So what?! That doesn't make the Thunder less of a solid team. There's a saying in Albanian "Sa ma nalt, aq ma poshtë". Translating it in English would sound very funny but I'll tell you what it means. It means that MAYBE we've been praising the team too much and that is the reason why they lost last night. If you had the chance to watch the game, you probably thought that the Thunder was going to win since they were doing a very good job during the three quarters. Dallas Mavericks outscored the Thunder in the fourth quarter due to Nowitzki's 17 points which led to 111-103 loss to the Mavs at Oklahoma City Arena. The Thunder guys did a great job at stopping Dirk Nowitzki and the rest of the team but they couldn't hold them for too long. 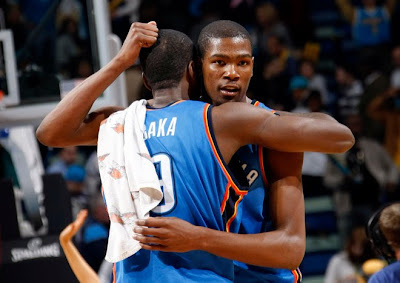 Durant's wonderful appearance was crowned as usual by scoring 32 points, 11 rebounds and five assists. Ibaka, Sefolosha, Westbrook and Collison did a great job too especially Ibaka who played a flawless defense on Nowitzki. We must always remember that OKC is a team with a lot of young players who don't have much experience but still, this year wasn't just a year better than the other ones. Instead it's a year that brought more experience. Another saying in Albanian is "Nuk ka rëndësi nëse rrëzohesh. Ajo cfarë është e rëndësishme është të ngrihesh përsëri". This one will not sound funny when I translate it for you. It means It's not whether you fall down, it's whether you get up again. Just because they didn't win, it doesn't mean that OKC gave up. It's Thanksgiving Day, so let's thank our guys for every game they played and for keeping us proud. Durant and the Thunder are on a 5 game winning streak when the Dallas Mavericks roll into the Ford Center tonight. The last time these two teams met was on April 4th and OKC walked away with a win in a high scoring game despite Durant shooting an abysmal 38.9%. Dallas has had some struggles this season and will be looking to right the ship on the back of Nowitzki who has been willing his team to victory. This looks like a good match up on paper but in my opinion it will be #6 in the streak for OKC! I'm talking about Kevin Humble Durant. After a two-game absence from a sprained ankle, Durant came back as if he never left. Along with teammate Jeff Green who had the same ankle issue, they lead OKC to victory against Minnesota with a result 117-107. Durant grabbed eight rebounds, five assists and scored 28 points while Green contributed by scoring 24 points. Westbrook's great appearance was crowned with 20 points and 14 assists. Sefolosha got an offensive rebound and kicked it out to Green, who scored a key three-pointer with only 54.5 seconds left. Except wonderful scoring numbers, the Thunder continued to do a phenomenal job of sharing the ball, a total of 20 assists on 24 baskets. This nine-game winning streak has helped the Thunder to rank no.5 in the Western Conference. 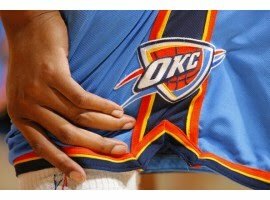 If our guys continue to keep up the good work, OKC will rise even more. Durant limped from his twisted ankle but not the team. Everyone thought since KD won’t be playing against Celtics the Thunder would have slight chances of winning. But they probably forgot that Westbrook was there and took all the responsibility to leave from Boston with a victory. He lead the Thunder to win over Celtics with a result 89-84. He did this by scoring 31 points, six assists, four rebounds and two steals. The Thunder led almost the entire game while the undefeated team at home wasn’t in their best shape. Offense without Durant and Green was fragile for three quarters. But defense and free-throw shooting helped OKC win. Royal Ivey’s great appearance helped the Thunder in a great way. He made a long jumper from the corner which was wonderful. But what it really made it special, was the fact that he did it almost the moment he checked into the game. Also, his three-point bank shot while the clock was running out was astonishing. 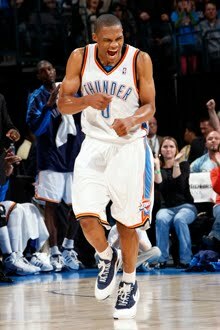 By doing so, Ivey gave the Thunder its first double-digit lead of the game. Third quarter, with only 38 seconds to go and up by only one point, OKC made all the right moves to stop the Celtics. The ball eventually got in the hands of Ray Allen for the shot but, the good news is that he missed it thanks to Thunder’s solid defense. It goes without saying that Westbrook did a phenomenal job as the leader of the team. It was especially important to win a game of this kind, against the team who hasn’t lost at home…until now. The Thunder played without Kevin Durant, the team’s superstar and leader. Even though he was inactive, he showed moral support. The cameras also caught him while he was going inside. He was wearing a knitted ear-flap hat, headphones and a backpack with the just-bought ticket on. and very soon we shall see, you fit, as fit can be . It's like my iPod is stuck on replay, replay. Then something happened. This song triggered in my head a video I had seen that I kept replaying. Voilà! I suddenly started smiling because I remembered the video. 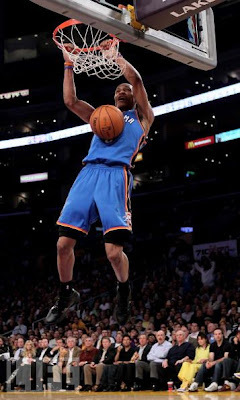 It's the moment when Westbrook takes back the stolen ball and slams! All of a sudden, I see people walking away from me. What I didn't know is that they somehow, felt threatened from my creepy smile. They didn't know I was smiling for a good reason though. Anyway, as the song kept fading away from my mind, I started thinking about the game that Thunder won over Rockets. I mean, did you see it?! 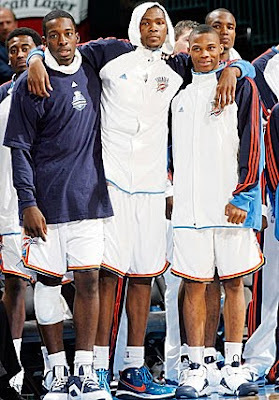 Did you see Durant, Westbrook, Sefolosha and the rest of the team? Because it you didn't, you really missed a wonderful game with a wonderful teamwork. The first half went pretty good with Durant scoring 17 points. But it's the second half that was amazing. OKC was playing a good game. Then the routine broke. Westbrook had the ball and in a matter of seconds Lowry stole it from him. As the whole team started to run on the other way, Westbrook decided not to let this one slip away just like that. He ran back, took the stolen ball and slammed! Let me "slow mo" this for you. Westbrook took the stolen ball back with the hey-that's-mine attitude. He started running and rose from the floor to slam. He probably made a phone call while on air! Boy that must have felt great. I can't even imagine how it felt to actually be there and see it happen. That's the most beautiful memory I took from this game. It was simply amazing. Of course Thunder won over Rockets by 116-99. So far, the Thunder won 7 games and lost 4 of them. Tonight OKC plays against Boston Celtics. I really hope the will keep up the good games and as usual, keep playing for the name in front of the jersey, not the one on the back. Here's the link to Westbrook's magic trick in case you didn't see it. I assure you it will be stuck in your head on re-re-replay-ay. Actually, his birthday was two days ago - 12 November. It was the same day when the Thunder played against Portland. Westbrook celebrated his 22nd year on earth by scoring 36 points that contributed to Thunder's victory over Portland (110 - 108). Willie Stargell said: When they start the game, they don't say work ball, they say play ball. So, even though you give your best, don't forget to have fun. After all, Westbrook along with the team, play for the name in the front of the jersey, not the one on the back. 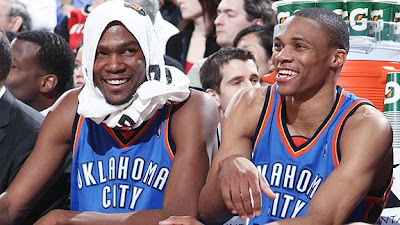 We wish you a long and happy life in OKC, together with us. Barack Obama, the U.S. President. not just for fun, it wasn't like that. but for Durant it wasn't late. Obama's aide Reggie Love, that's all. grandmother and teammates but no other. since they tweeted "I love my LIFE". Who is he? – An anti-sports girl would ask. ONLY the tall, dark and handsome guy that all girls dream of! – Would answer another one. There are 5 reasons why I think like this. Let me tell you why Kevin Durant is my favorite basketball player. 1. He is a humble person – I know that every time you read something about KD, it’s IMPOSSIBLE not the notice the word humble. Well, let me tell you that if he wasn’t, people wouldn’t be mentioning it. But what really strikes me is the fact that he doesn’t have the ” I’m a star. I’m unapproachable” attitude while putting his shades on. It’s actually completely the opposite! He talks to his fans, lets them know about his day and asks for their opinion on different matters. As you’ve probably seen lately, Durant moved to a new neighborhood and has a big fan who lives next door. His name is Mathias Murphy and he’s been posting videos of KD while he’s eating breakfast, taking out the trash, etc. In this case, an average superstar would call the police. But considering the fact that KD is above average, he actually invited him over for a game. Need I say more? I don’t know about you, but I noticed this at the FIBA World Championship. During the games Durant made an excellent appearance. He never behaved aggressively and was always patient while waiting for his turn. You can notice that at all of his interviews, he remains down to earth and never praises himself. A trait which, honestly is almost in the same level as the species that are near extinction. 3. He has a big heart – I’ve drawn this conclusion based on his actions. I have had the chance to read about his KD shoes during the FIBA World Championship. What was special about these shoes, except their nice colors, was the fact that he wrote ON them about the 9/11 tragedy. He found a subtle way to express his condolences to all the families that lost their dear ones. Which leads me to the 4th reason. 4. His attention to detail – To me, the little things are the ones that count. Kevin Durant used his eye to detail in a very intelligent manner (back to the KD shoes). These are not just any kind of shoes that contain a beautiful graphic; every line and logo has a special meaning to Durant: the logo inside the shoe, containing the letters W P, refer to the initials of his parents’ names. The number 35 represents the age when his first coach, Charles Craig died tragically, etc. As a detail-oriented person, I have noticed that a few seconds before shooting a free throw, Durant moves his right shoulder in a very subtle way which, I think is adorable. Also, at his velvet hoop commercial, you can notice how he slightly raises his right eyebrow while singing (If you think this detail-oriented thing of mine is weird, wait until I tell you about my obsession with people’s noses!). 5. He’s one of a kind – Kevin Durant has the perfect combo of personality, talent, hard work and, ahem, physical appearance. It’s needless to say that this kind of combination leads to uniqueness. 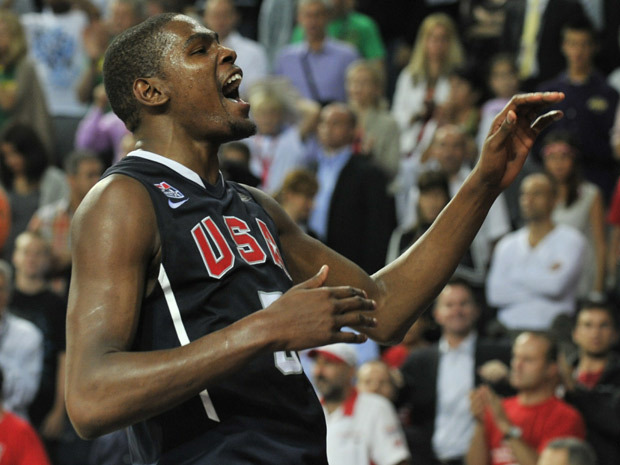 Kevin Durant is no “next Michael Jordan” not even Kobe Bryant or LeBron James. He’s the first Kevin Durant and the young players to come, are going to be referred as “the next KD”. Now, I don’t make predictions, I’ll leave those to fortune tellers and people who are good at this. But as an optimistic and a firm believer, I truly hope and believe that Durant will keep his positive traits and enrich them even more as time goes by. He is a role model for many boys who want to be successful basketball players. Imagine how wonderful it would be if they adapted Durant’s personality. Humbleness after all, might be saved from extinction. Now that would be worth-mentioning when writing about the greatest, positive influences in the world! It’s not always easy to be in charge. Let me rephrase that — it’s NEVER easy to be in charge. Ask the oldest kid of the family. In case you are the oldest one, you’ll know what I’m talking about; people always expect you to be the best and responsible for everyone else’s actions; they expect you to carry the heavy weight – believe me, I do this with my older sister. Nevertheless, the oldest ones are the role models. They are the ones that write the book so that the youngest ones can learn from it. We are the ones who usually are unintentionally forgotten because the oldest sibling needs the undivided attention at choosing the right path, and the youngest ones…well, they’re just way too adorable not to cover the with love and presents! The same happened at the 2010 FIBA World Championship in Turkey which was won by the amazing, B team! Not first, but second team, second choice! They say that top cats often begin as underdogs and this case is the living proof. The OKC’s duo, Kevin Durant and Russell Westbrook were instrumental at bringing home the victory after 16 years. They not only helped winning the gold medal but they also set personal records. Kevin Durant’s appearance was astonishing by scoring 38 points (record) in the finals, an average of 22.8 points per game, third best among all tournament participants, grabbed 61 rebounds per game, shot 55,6% from the field, 45,6% from 3-point and 91.2% from foul line. Needless to say, this kind of appearance can only be crowned as the MVP of the World Championship. Russell Westbrook was no less successful; he helped to win the gold medal by a summary of 82 points in total and a 84.0% free-throw average. Also, it is worth mentioning that he is one of the top 25 shooting guards in the nation. Now, I truly hope that Durant and Westbrook saved some of the art they did, for the new season of the NBA. An art of that kind, combined with the rest of the team HAS to result in a masterpiece! An armed to the teeth team with all the determination and passion needed to make it to the top, lead by Kevin Durant, whose glory, devotion, grace and humbleness are all that’s required to be the best. As they go step by step shaking the ground, the crowd goes silent. We watch the magic happen.